Since I first saw the custom Inglot palettes I knew that one day I had to make my own. With a HUGE selection of colours to choose from, the possibilities were endless and to create your own palette with colours you know you’ll actually use is perfect. 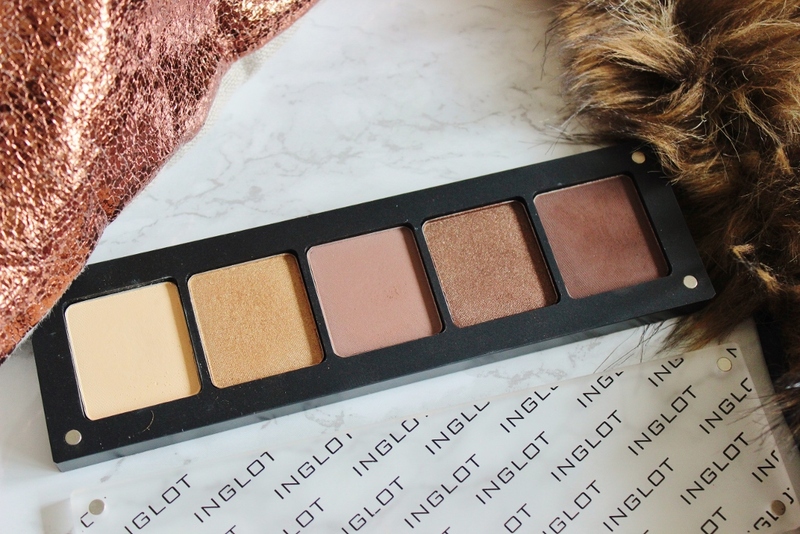 The trouble is the nearest Inglot store to me is...well not all that near, so when I did finally get the chance to visit one, years later (sounds dramatic but its true lol) I jumped at the chance to create my own! Actually seeing all the shadows in-front of me was both exciting and slightly overwhelming, it took a good half an hour to settle on the shades I wanted. I knew I was going to put together a neutrals palette because lets be honest, they’re the shades I reach for the most and I have to say I’m over the moon with my final palette. From the beautiful, sturdy, magnetic design to the fantastic quality of the shadows, I would buy it again in a heartbeat. There are a variety of palettes that you can create from a full 40 pan, 20 pan, 10 pan, 5 pan, 4 pan, duo and single pans. There are also other mix and match sizes and you can see the whole selection here. I didn’t want to invest in a 10 pan because it was rather a large amount to spent (the palette itself costs £12.00 and then each shadow cost £5.00 each making the total amount of a 10 pan adding up to £62!). Instead I opted for the 5 pan, which costs £8 and they had a deal on in store where they charge £30 in total for the palette and shadows - you only save £3 but hey that’s still something. The whole idea of the freedom system is that you can mix and match eyeshadows, blushers, concealers and essentially have the freedom to create a custom palette which works best for you. Each of the freedom system palettes are sleek, matte and look so good! I like the fact that the lid of the palette is made of frosted glass, making it easy to see the colours if you have several in your collection. They can also be easily stacked due to the magnetic design which is a great feature for makeup artists and it shows real thought has been put behind the design. The shadows come separately packaged and you can slot them in whatever order you prefer. The single shadows cost £5 and you can also purchase the ‘rainbow’ range which cost £6.50 and have an ombre of one colour (eg. deep orange, mid tone orange and light orange). The palettes are reusable, making them environmentally friendly, although its a little bit of a mission to actually get the pans out! I got home and quickly tore the packaging off, putting the pans in the order I wanted....only to realise I hadn’t written out the numbers of the shadows .___. which was a silly mistake. I then had to try and gently prise the pans out from the palette, without damaging the shadows and it took a couple of YouTube videos and a lot of patience to finally get them out. Won’t be making that mistake again! The eyeshadows are all numbered which is a shame, they could have come up with creative names instead, but they matched each to a number (and they don’t exactly seem to be ordered in any way??). Each eyeshadow pan contains 2.3g which is almost double the size of MAC’s and they cost half the price! Most of you will know I’m boycotting MAC anyway, but even before I started boycotting them I despised the amount they charged for their shadows. The quality of Inglot shadows are just as, if not better than MAC’s and you are given a huge array of choice. On to MY eyeshadow palette (finally) - from left to right we have 313, 155, 357, 42 and 327. Although these shadows are all decently pigmented alone - I never wear eyeshadow without a concealer/base first so I decided to swatch each shadow alone once and then over a base right next to it (the essence I heart stage base was the one was used here). 313 - The perfect base colour, I always dust some shadow over my eyelids no matter what as I conceal the darkness and this shadow does is great for setting it in place. It is a light yellow/ cream colour, a few shades lighter than my skintone and it brightens up my eyes when worn alone. It also makes any colour over the top stand out brighter too. As you can see the base really makes this pop, so a little goes a long way. It’ll probably be the first shadow I repurchase as I use it almost every day. Also it makes a superb brow bone highlight. 155 - I am a huge fan of gold eyeshadows, they compliment brown eyes beautifully and the moment I swatched this I knew I had to have it. 155 is a ‘shine’ type of shadow and its again a yellow/warm based gold colour which is flattering all over the lid, yet also not too dark on my olive skintone to add a pop of colour on the inner-corner. Though its a gold shadow it’s not too striking, which means its more versatile and wearable than a more true-golden shade. My favourite way to wear it is in the inner third of the eye, it adds just enough shimmer and glitz without going over-board for a day-to-day look. 357 - This is the shade I picked up as my go-to crease shade. It is a medium toned brown which has a slight coolness to it. Interestingly, though this is also a matte shade it does seem to change in colour over a base, so you can certainly build it up. I like how the grey in the shade adds a shadow like effect without losing the warmth. Though quite different from the shade salted caramel (too faced chocolate bar palette) which is a wonderful crease shade too, this is a firm favourite. On a standard day I’ll run a little of this through the crease, with 313 as the base and voila I have a perfect matte eye, with no effort at all. It does what I wanted it to do, with a little going a long way so I’ve barely made a dent in it at all. 42 - I wanted to get a shimmery/shine brown shade and 42 is absolutely beautiful. A rich, earthy brown with a bronzy undertone. It is the perfect shade to accompany 155, these two were made for each other! I love this shade for adding more warmth and a touch of darkness, or packed over most of the lid as it’s so versatile. It’s actually appearing lighter in the swatch then it does on my eyelids but it is buildable so it has many uses. Sometimes I like to add a tiny bit and smoke out my bottom lashline and because its not too dark, it doesn’t look super intense! 327 - The final shade I picked up is a dark matte brown, with a pinch of coolness to it. It is perfect for turning a day look to a night look. Highly buildable, so a little can add some great definition to the crease, or you can build a full on smoky eye with this shade. Applied under the lower lash line, it adds more depth and definition and I also like to use this instead of eyeliner for a softer look. When travelling with this palette, I had to use this shade as a brow powder and it looked, surprisingly, really great as it’s not too warm, yet you still only need a little to fill in the sparseness. So its great to know that, if I leave the ABH pomade at home, my brows can still have some structure! Overall another fantastic versatile, deeply pigmented shade. This post is super super long, but I hope it has been useful for you! 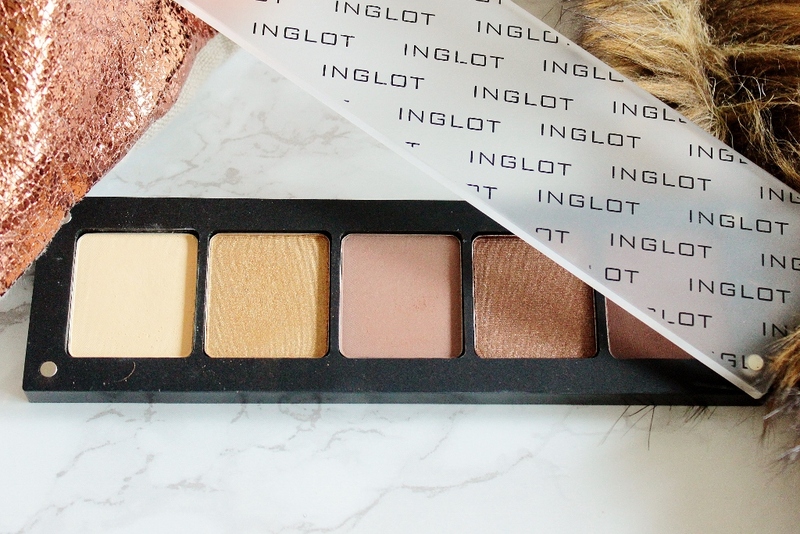 I believe the Inglot freedom system palette is one of the best custom palettes/ranges around. You get real bang for your buck as they say, with almost double the amount of product from other companies, for such a cheap price. The range of shades available is phenomenal, and there is a great consistency across the range in terms of quality. They blend together with ease and a little goes a long way meaning these will last me for ages. With a base each of these shades are highly pigmented and I must say the colours I put together work wonderfully. 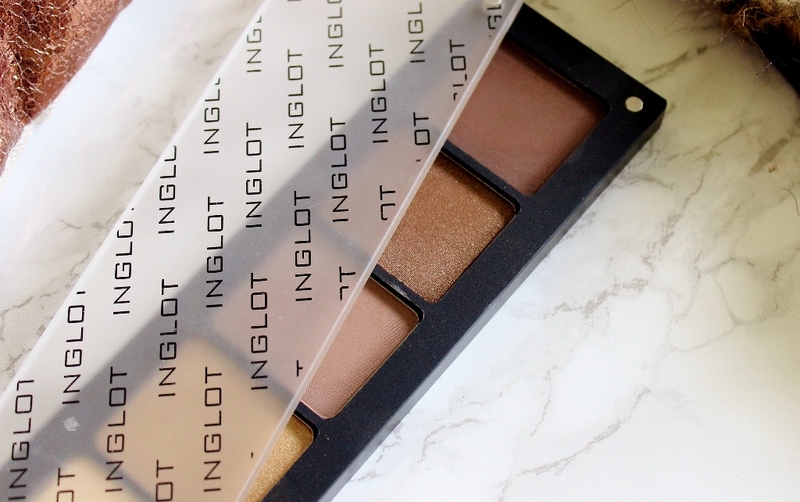 I’ve been using it consistency since I bought it and though I have enough palettes in my collection to keep me satisfied, when I next want to make a custom palette Inglot is the place I will be visiting! They also have a pretty cool feature where you can do a virtual make over where you can pick a model (or upload your own face) and then choose colours and see how they look on the virtual model, which is vaguely like playing one of those strange makeover games but it’s pretty accurate! 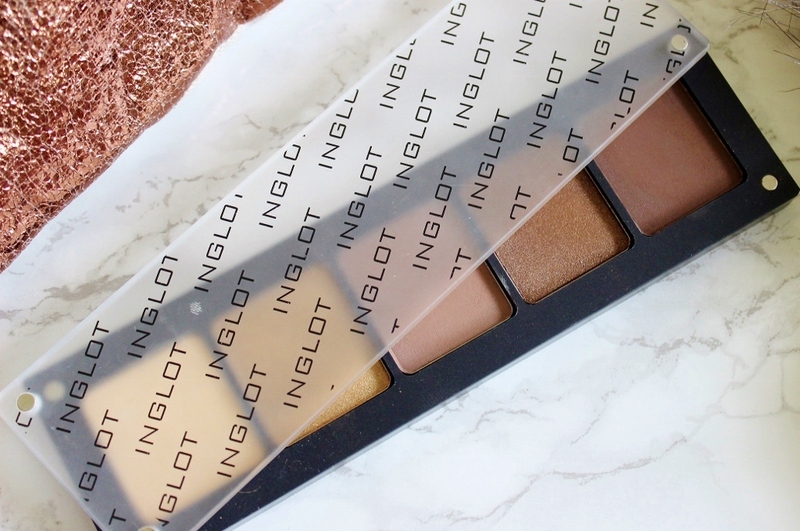 I wish there were more Inglot stores widely available though, as I do think swatching the shadows in person is an important part of making your own palette, so when you next get the chance be prepared to spend a good half an hour or so indulging yourself in the huge selection! 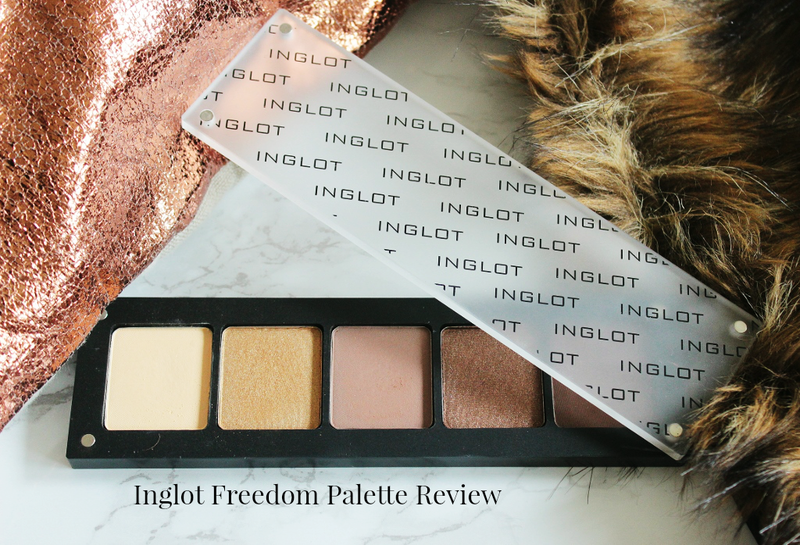 Have you tried the Inglot Freedom Palette Range?